On a small, nearly isolated Italian island, a fisherman, Mario Ruoppolo (Massimo Troisi), lives with his father. A rather simple-minded young man, Mario hates being out on boats all day and complains of the moisture, so his father tells him to get a job. One night, at the movies, he sees a newsreel covering the arrival of famed Chilean poet Pablo Neruda (Philippe Noiret) to Italy. A communist, Neruda has been exiled by political opponents and has come to live on Mario’s little island. Mario sees a sign on the door of the post office advertising for a postman with a bicycle to deliver mail. The next morning Mario applies and finds out that it is a part time job to deliver Neruda’s mail. As he does his job, he begins a dialogue with the poet. At first, he is looking for an autograph, so he can show he is a friend of great Neruda and get girls, but as he reads the poetry, he discovers that it appeals to him in some way that he can’t explain. The poetry stirs in him both a desire for love and a desire to fight for the cause of the oppressed. Wanting to write his own poetry, he asks Pablo how to go about it and that leads to an explanation of metaphors. 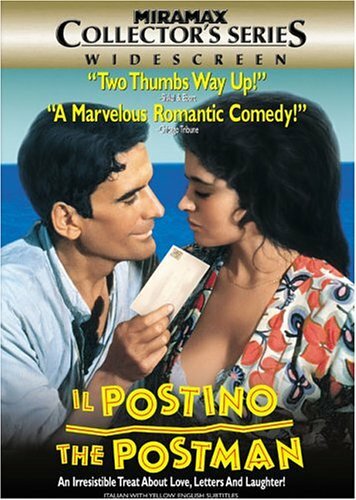 When Mario falls in love with Beatrice (Maria Grazia Cucinotta), the niece of the local inn owner, he begs Pablo to help him win her by writing some poetry for him, but the poet refuses, instead giving Mario a beautiful book of paper to begin writing his own poetry. He brings Mario to the inn and signs the book in front of Beatrice. Using Pablo’s poetry, Mario begins to woo her with great success, so much so that Beatrice’s aunt becomes upset, complaining about the evil metaphors in the poetry. Massimo Troisi was a beloved Italian actor long before Il Postino, mostly for his wonderful comedic roles. When he found the book Ardiente paciencia by Antonio Skármeta, he bound himself to the project, committing to not only star in the film, but to help write the screenplay, along with director Michael Radford, Anna Pavignano, Furio Scarpelli, and Giacomo Scarpelli, even though he was having serious heart problems. He put off surgery in order to the film and dies shortly after it was completed. The film is beautifully photographed, full of light and color, with the sea surrounding the island always prominent. There is a great deal of Neruda’s poetry included in the movie and it certainly enhances the beauty. The film’s Academy Award winning score, composed by Luis Enríquez Bacalov, is beautiful and gives the film a heightened sense of the love not only between Mario and Beatrice, but the brotherly love between Mario and Pablo. Besides the win for film score, it was also nominated for Best Picture, Best Director, Best Actor, and Best Screeplay Adaptation. The soundtrack features many well known actors reading Neruda’s poetry to the film score. Some of the readers include Julia Roberts, who backed the project, Glenn Close, Ethan Hawke, Andy Garcia, Madonna, and Wesley Snipes, among others. This is an excellent film. It is beautiful, full of poetry, music, and love. In Italian, with subtitles in English, it runs an hour and forty-eight minutes.